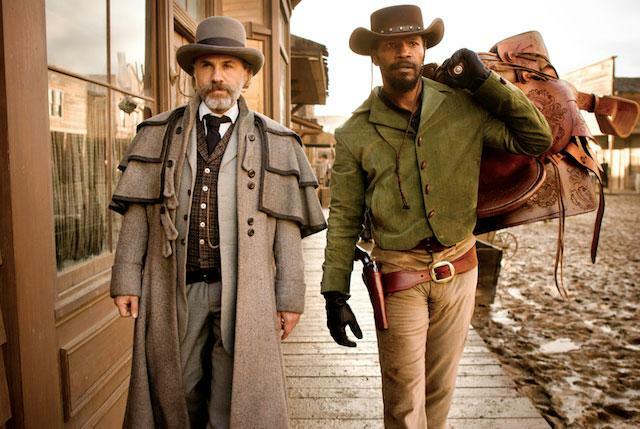 On a cold, desolate night in the winter of 1858, Dr. King Schultz (Christoph Waltz) comes across a couple of slavers and their walking wares, intent on purchasing a specific slave from them: a slave by the name of Django (Jamie Foxx). When the slavers are less than forthcoming, Schultz dispatches them and, after writing out a bill of sale, takes Django with him. Despite the ridiculous giant bobbling tooth on top of his wagon, Schultz is actually a bounty hunter, a good one at that, and he needs Django to help him track down three men who worked at a plantation where he had previously been held. The two reach an agreement; they will partner up to pursue the men and collect the reward, and in return, Schultz will give Django his freedom. Django readily agrees since, for a slave living in the Antebellum South, killing white people for money is a pretty good way to make a living. For twenty years, Quentin Tarantino has been cinema's premier mash-up artist, a freewheeling maverick who delights in filtering thousands of films through his own sensibilities, in the process transforming trash into pop art with giddy ease. After the indulgent but fun Kill Bill films and the merely indulgent Death Proof, he rebounded with the sprawling war saga of Inglourious Basterds, a film which delivered on all the promise that he had shown in his earlier films with less of the baggage. Django Unchained finds him on possibly the best form of his career, as he takes the style of the Western and uses it to explore his love of the genre in the most deliriously entertaining way imaginable. Tarantino always seems to be playing a game of brinkmanship with himself, seeing how far he can push a genre before it breaks down completely. In Django Unchained, that involves taking the standard tropes of the Western like gunfights, gorgeous landscapes and derring-do and asking what it would be like if a black man was the hero of an often painfully white genre. To that end, the film shares as much with the blaxploitation genre as it does with the Western since the racial politics of the former add bite to the traditional form of the latter. It allows Tarantino to explore some of the darkest, most repulsive aspects of the slave trade - most notably through the use of historically inaccurate but viscerally effective Mandingo fights - under the guise of making a throwback Western. It's more John Shaft than John Wayne. It's an angry, intelligent film about the great obscenity of American history dressed up as one of its most conservative genres, but which also happens to work as a great example of that genre. He even finds time amidst the bloodshed to fit in an uproariously funny scene in which bickering proto-Klansmen argue over their attire, which again underscores the politics of the film in a way which is entertaining without hiding the ugliness of slavery and racism. It's quite a trick that Tarantino pulls off with Django Unchained, and he does it with consummate flair. Yet Tarantino is no mere pastiche artist; he fully commits to the idea of creating his own real, full-blooded Western. (Or, to use his own preferred term, a real, full-blooded Southern.) Django Unchained looks as beautiful as the films that inspired it, demonstrating once again that Tarantino is one of the great stylists of his generation. Yet despite owing a clear debt to the spaghetti Westerns of the '60s and '70s (it takes its hero's name and theme song from one such film starring Franco Nero, who makes a brief cameo) Django is clearly its own beast. As with all of Tarantino's films, it sounds like only he could have written it, and the script overflows with clever, witty dialogue that has little to do with the plot but everything to do with the characters. Like Rio Bravo, a film Tarantino has expressed a great deal of admiration for, Django Unchained is a great hangout movie, one filled with characters that it would be a pleasure to spend time listening to with or without the accompanying (not to mention copious) violence. The central friendship between Django and Schultz is wonderful, and features the best interplay between any of his characters since Jules and Vincent in Pulp Fiction. Waltz brings the same easy charm to Schultz that he brought to his Oscar-winning turn as Hans Landa, though here he is merely unscrupulous, rather than monstrous, which is a slim but momentous distinction in Tarantino's films. He's a man who seems to be in control of every situation, even one in which literally hundreds of guns are trained on him, and watching him scheme and plan throughout the film is an utter joy thanks to Waltz's perpetual bemusement. Foxx, meanwhile, oozes movie star magnetism and furious intensity as Django, making him fully convincing when he is wreaking vengeance against those who have wronged him and lending real emotional power to his quest to rescue his wife Broomhilda (Kerry Washington) from the nefarious, moronic plantation owner Calvin Candie (Leonardo DiCaprio, whose dead-eyed quality has rarely been better used than it is here). Though the whole film is pretty wonderful, filled with indelible moments and spectacular sequences, its best moments are often those quiet ones in which Django and Schultz are getting to know each other through their shared love of murder. As with Inglourious Basterds, there is a slightly loose, ambling quality to Tarantino's storytelling that at times makes the film seem aimless. This is particularly apparent in the first and third acts; in the former, Django and Schultz have to go on a sub-quest before the real heart of the movie is revealed, and in the latter the supposed climax is delayed by a brief, strange diversion. These threads are entertaining in their own right thanks to the witty dialogue and even wittier action, but it does occasionally seem as if the film doesn't know where it's going. But Tarantino knows where it's heading, and he takes the audience on one hell of a ride before he gets there. Tarantino ended his last film by having Brad Pitt say "I think this might just be my masterpiece." After watching Django Unchained, it is now abundantly clear that he used that line for the wrong film.